This chip will be used for some Galaxy S7 units, expected to hit the market next to Qualcomm Snapdragon 820-powered ones. Multiple reports that made it online in the past few months claim that Samsung's next-generation Galaxy S flagship will come powered by two different processors. One variant is expected to use the Qualcomm Snapdragon 820 SoC while the other will allegedly pack the Samsung Exynos 8890 chip. Benchmark scores of this processor already leaked online a few times and they look impressive, but insiders claim that Samsung decided to spend some extra-time to improve its performance and efficiency even further. According to ETNews and other South Korean publications, mass production of the Samsung Exynos 8890 has recently begun. 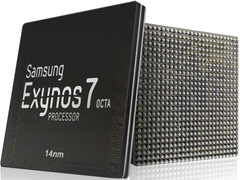 The chip is a 14 nm FinFET part that features custom 64-bit Exynos M1 cores. Obviously, the company still has to confirm these rumors, but they will probably announce the chip close to its availability on the market. Reports claim that half Samsung Galaxy S7 units will use the Snapdragon 820 chipset while the other half will use the Exynos 8890. Rumored features include a 20 MP camera with RAW support or a 12 MP one with a generous 1/2-inch sensor, as well as Cat. 12 LTE connectivity.